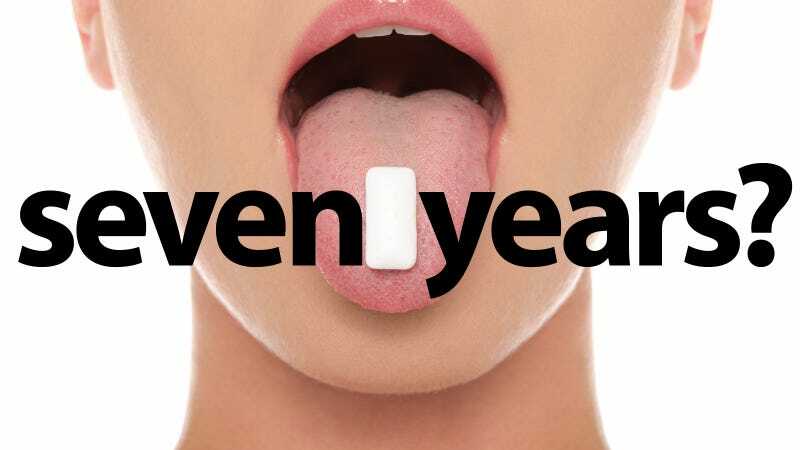 You've heard the warnings: If you swallow gum, it will stay in your digestive system for nearly a decade. Which would mean there's a decent chance you've got some hanging out in your gut right now. If you look at its ingredients—a delicious mix of indigestible compounds—it certainly seems possible. And if you look at the medical books, swallowed gum has caused some serious problems. Is it possible that your mom's crazy warnings were right? The first tale was of a four and a half year old boy who had been addicted to chewing since he was two. By the time his parents finally took him to get help, he was up to seven pieces of gum a day—each one he had conveniently disposed of down his throat. When the mass created a blockage, his doctors had to pull the "taffy like substance" from him manually. The next subject, also four, would indulge in gum several times a day as a reward from her parents. The subject was known to gulp down her first piece just so she was allowed another. In the end "multiple spheres of chewed gum congealed into a multicolored rectal mass"—their words, not mine—had to be extracted. The final tale comes from a regular gum-chewing one and a half year old. The girl apparently decided to spice things up by taking in four coins with what she was chewing. The mass had to be pulled out via a special coin-in-body retrieval system. Not good! But these are extreme cases—just three out of possible millions. It's possible that we've been accidentally swallowing gum for centuries. Lumps of tar that date back to 7000 BCE have been unearthed in Northern Europe with teeth impressions in them. And chewing gum was primarily a young people's thing even then; teeth marks show that users typically fell within the 6-15 age range. Later on Greeks chomped on resin from the mastic tree, named for the related chewing action. The right kind of resin could pick up overtly gross things from one's teeth while also serving as a bit of a breath freshener. When the New England colonists settled in America, one custom they picked up from the Native Americans was chewing gum—in this case spruce resin. The modern incarnation of chewing gum actually comes from an engineering mistake. In the 19th century, industrialists lauded chicle, or the latex collected from a tree in the Yucatán, as a promising rubber equivalent. In 1869, Antonio López de Santa Anna, an exiled former president of Mexico living in Staten Island, thought he'd check out the claim. Santa Anna brought in a ton of the stuff from Mexico and hired an inventor, Thomas Adams, to work out its vulcanization process. The only problem was, it didn't work. Not only was the project a failure, but Adams was also left with the remainder of the material. Although the stuff wasn't going to work for tires, Adams did notice that the material had some remarkable qualities. When the resin was dried, for instance, he found it was insoluble in water and quite plastic. Why he then thought to stick it in his mouth, who knows? But what we do know is that he patented his chewable material in 1871. He eventually added of flavors, which allowed his gum to do better in drug stores that the sweetened paraffin sold for the same purpose. A little later, Wrigley's, with the right marketing, made gum famous. Since then, we've all accidentally gulped down a few varieties of chewing gum, but it's highly unlikely they created a cast off colony our guts. It's possible the rubbery pieces might have lingered a little longer in our digestive system than, say, a milkshake, but even that delay is debatable. The reason: our stomachs are actually remarkably efficient systems for shoving food through, digested or undigested. Most of what makes up gum falls in the "undigested" category. Our saliva takes an early stab at digesting food, and it will penetrate the Chiclets' shell or the sweeteners inside a stick. But the base material—a combo of natural and synthetic gums and resins that make up to 30 percent of what we chew—is mostly impenetrable. Even then, our stomach muscles contract and relax, earthworm style, to force the things we swallow down and out. So no, unless you're replacing meals with the stuff, you're probably OK.
That is not to say you shouldn't listen to your mother. Technically speaking, she has a point.